We are grateful to the family of the late Derek Phillips for their permission to use much of the text and images from the website that was set up and run by him. Derek was very interested in local history and his community and a short biography can be viewed on the introductory page. West Ewell was known at the end of the 19th Century as Upper and Lower Marsh. The area consisted mainly of the farmland of Park Farm, Fitznell's Farm Poplar Farm and Scott's Farm. There were a few dwellings, which were mostly the homes formerly occupied by workers at the nearby Gunpowder mills on the Hogsmill. Much of the land alongside the river was owned by Alexander Bridges, whose family had lived in the Manor House (now Ewell Court House) for many generations. This map is reproduced from the deeds drawn up at the time and shows how the land was divided up. In 1878 Alexander Bridges sold some of the land to the south of the Hogsmill River to a Mr Gadesden, resident of Ewell Castle. Maybe this was to finance the building of Ewell Court House, which was completed in 1879. Reciting under and by virtue of an order of exchange under the hand and seal of the enclosure commissioners of England and Wales dated the 18 July 1878 pieces and parcels of land and hereditaments shown in the plan drawn in the margin thereof and thereon coloured green which were recently the property of the said A W Gadesden being portions of two farms called respectively Ruxley Farm and Fitznells Farm to the remainder whereof the said A W Gadesden still remains entitled for an estate in fee simple in possession free from unemcumbrances were awarded to and become vested in the said A H Bridges his heirs and assignees for a like estate in fee simple and by the same order of exchange the pieces or parcels of land and hereditaments drawn in the said plan and thereon coloured red which were recently the property of the said A H Bridges being portions of an estate called The Ewell Mills Estate to the remainder whereof the said A H Bridges still remains for a like estate in fee simple were awarded to and became vested in the said A W Gadesden his heirs and assignees for a like estate in fee simple. And Reciting upon the treaty for the said exchange it was agreed and between the said A H Bridges and A W Gadesden that the said A H Bridges should make and maintain the boundary fence thereinafter mentioned and enter into the covenant thereinafter contained that the said A W Gadesden should also mutually release the rights thereinafter mentioned. It was witnessed that in pursuance of the said agreement in this behalf and in consideration of the premises he the said AH bridges thereby for himself his heirs executors And [ads] covenanted with the said AW Gadesden his heirs and assignees that he the said AH Bridges his heirs executors [ads] and assignees or other the owners for the time being of the said Ewell Mills Estate would at his own cost and expense and on his own estate forthwith make and forever thereafter maintain a good and sufficient boundary fence in accordance with the section of the same delineated on the said plan between the said Ewell Mills Estate and the said farms called Ruxley Farm and Fitznells Farms such fence consisting of a ditch 3 feet wide and 2 feet deep also a quick set? Hedge planted on a bank at least 2 feet above the present surface of the ground and having a ditch at each side thereof in the position indicated on the said plan such quick set hedge being protected by posts and rails until the same is properly grown reserving the right to substitute any other equally substantial and ornamental fence on the boundary line of the tow estates and also that he the said AH bridges is heirs and assignees will from time to time and at all times hereafter maintain on and under the land coloured green on the said plan and the adjoining lands lying between the said land coloured green and the old the old bed of the river the necessary culverts channels and drains for securing the free passage and running of water from the said farms called Ruxley farm and Fitznells farm to the said old bed of the river in a free and uninterrupted manor reserving the right to divert the whole or any part of the same or to alter them from covered to open courses or from open to covered courses provided the free passage of water is not thereby prejudiced or affected. And it was also witnessed that in further pursuance of the said agreement in that behalf and in consideration of the premises he the said A H Bridges did thereby for ever give up abandon and release into unto the said A W Gadesden his heirs and assignees all rights of way of a private nature which he or others the owners or occupiers of his said estate might have theretofore enjoyed over the aforesaid farms and lands of the said A W Gadesden and he the said A W Gadesden did in a like manner give up abandon and release unto the said A H Bridges his heirs and assignees all rights of way of a private nature which he or other the owners of occupiers of his said farms and lands might have theretofore enjoyed over the said estate of the said A H Bridges. Alexander Bridges went on to build All Saints Church in 1894. The parcel of land sold to Mr Gadesden by Mr Bridges in 1878; this land contained a number of weather-boarded cottages known locally as the "Black Cottages" presumably because they were painted with tar or bitumen. They stood on a track known in the 1870's as the Ewell and Ruxley path. These cottages were originally built for the mill workers or "powder monkeys" or "powder monks" and stood until the early 1930's when they were replaced by the semi-detached homes that now stand in Northcroft Road. My particular interest the area stems from the fact that I was born and bought up in one of these semi's with the Hogsmill open space and the roads of West Ewell as my playground. It turns out, in fact, that I was born on the site where a certain James Baker and his family lived in the 1860's. The unfortunate Mr Baker was a victim of an explosion at the gunpowder mills in 1863 and a memorial stone for him can be found in St Mary's Churchyard in Ewell village. Whether this stone marks his final resting place is doubtful as little of his remains were ever found. Read the newspaper reports about the Gunpowder mill explosions. "Ewell Marsh is the land east of Plough Rd and west of the great line of elms now being covered with roads and houses. There were also woodlands scattered among the plough lands." West Ewell grew up around the junction of Chessington Road and Plough Road, where a number of weatherboard and brick built cottages still stand. Some of these are obvious and others are hidden behind the shops on the south side of the road; "Jubilee Parade". The following description of the development of the "Plough Road Parade" is a compilation of a verbal record I made in the mid 1990's. The interviewee's ranged between 65 and 90 years old so there are a number of ambiguities because of the range of time the memories span, and of course everyone has a slightly different recollection. The land to the right used to be the original Plough Rd. corner - but I've only just noticed it's gone! When did that happen? At the beginning of the 20th century you could count the shops on one hand, the one where the cab company is now used to be the general store. Opposite was the newsagent (No.222) which had been in the Baker family since the 1890's. Apparently these Bakers were related to James Baker who died in the gunpowder mill explosion of 1862. The shop still remains; unsubstantiated rumour says that the cottage behind was built from materials from the demolished Nonsuch Palace. Its a nice story but unfortunately unlikely to ever be proved correct, although if the cottage is the one marked on the 1865 Ordinance Survey map then it must date from early in the 1800's or before. The Shop was not built until around the 1880 at a rough estimate. These two shops were later joined on the north side of the road by, the corner shop, Beams: Tobacconists/sweets. Douglas Strikes Stores, Thelton's or Baldwin's or Fulker: Butcher, Felton Dairy. The yard behind the archway was Charles Fulker's Builders. A Haberdashery shop with a Post Office in it owned by Frank Fulker. Mrs Tyrell from Poplar farm used to trade from 2 baskets on her arms. As more and more houses were built trade increased and eventually she got half a shop on Chessington Rd near Beams. The other half was Ralph Brown the shoe repairers. Milk delivery was by horse and cart from Scott's farm in Ruxley Lane. It was measured into the customer's jug with various size pewter dips from tall churns. Bread came from Carpenters Bakery in Ewell village. Another row of black cottages between Bakers Newsagent and the Co-op/White Castle Restaurant, were demolished in the early 1960's. 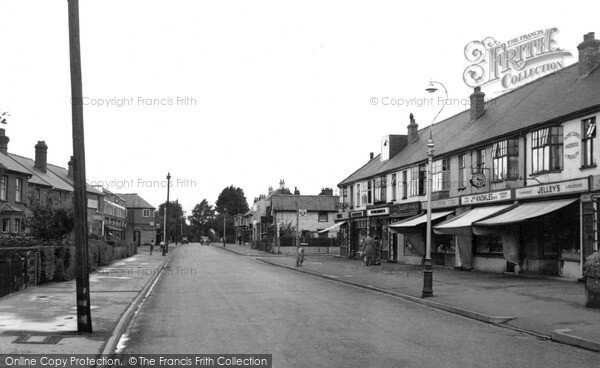 The shops past Plough Rd (after 1929) were as follows, the corner shop was Turners the Bakers, with a bake house at the back. A TV shop, Reynolds, which had the first Televisions in West Ewell. Phillips the Iron Monger whose son was the late Freddie Phillips of BBC fame. A Grocers, Venus. Critchley, sweet shop, Chemist, Jelly's fishmonger (Mr Jelly used to deliver fish by horse and cart and later by motorbike and sidecar.) , and a drapery. The shop opposite, previously the general store (now Cab Co) was a cycle shop, this and the drapery were owned by the children of a Mr Oldacre. The Drapers shop belonged to his daughter Doris, the cycle shop "West Ewell Cycle Works" belonged to one of his sons called Albert, the grocers another son Jim. The workshop used by the present tyre company was built during the war and used for the manufacture of aeroplane parts. As well as the general store, on the south side of Chessington Road was the Church Sunday School previously known as "The Chapel at the Hamlet" and was an initiative of Sir George Glyn while he was Vicar of St Mary's Ewell. It was later taken over by Sir Arthur Glyn and is recorded as the Social Club on maps by 1919. There would have been little use for it a Chapel after All Saints Church was built in 1894. After some Black Cottages by the side of the Sunday school/Social Club were pulled down and replaced by shops, Mrs Tyrell from Poplar Farm had one of these. There used to be a toll gate at top of Plough Rd. This was closed once a year to retain rights over it. The strip of land next to the existing wooden shop (no 222) where the Pub sign was used to be a path to the Pub, owned by the Turk family, now that piece of land belongs to the shop and the modern Plough Rd is a few yards over. You can see an original brick post still standing in this location. There were a number of wooden cottages at this end of Plough Rd. which housed a Cobblers. A blacksmith is recorded as being there in 1899. The photo clearly shows the older cottage behind the shop. At the turn of the last century Chessington Rd was known as Marsh Lane. At the end of the 1920's plans were drawn up for the building of the streets and houses that we know today. (if you don't know the area take a look at the aerial photo) If we make the assumption that the shops at the junction of what we now call Plough Rd was the centre of West Ewell (known then as "the Marsh) then we can study the development of each side of this area separately. As explained earlier the text and images for this page came from the website run by the late Derek Phillips. To preserve his work and allow ready access to it, it was decided to merge his local history pages into the Epsom and Ewell History Explorer website. Of necessity some minor changes to the text were necessary and the layout has been changed to fit in with the house style of Epsom and Ewell History Explorer but in essence the web page is Derek's. The family of the Late Derek Phillips makes every effort to ensure that the information on this web page is accurate. However, they cannot accept responsibility for any loss or inconvenience caused by reliance on inaccurate material contained in this site. Links to other sites are provided for your convenience, the Phillips family cannot give endorsement of them. They cannot be responsible for any information contained on other websites. All material on this site (including text and images) is copyright. Every effort is being made to ensure that all sources are credited. Where no credit is given then it should be assumed that the copyright in any particular item resides with the Phillips family or that the Phillips family should be contacted to ascertain who owns the copyright before text or photographs are reproduced elsewhere. Educational use is permitted provided that no changes are made to the material and Derek Phillips is acknowledged as the source. Commercial usage is prohibited unless formal written permission is obtained beforehand.